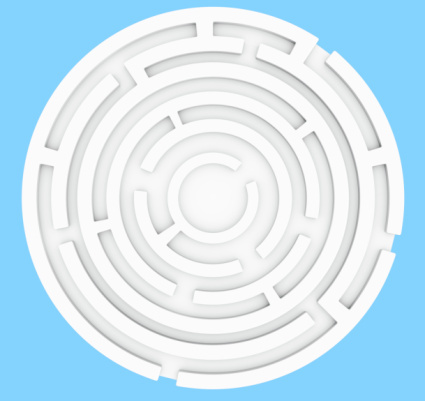 Should you walk the labyrinth? The modern labyrinth movement is a troubling New Age trend that is introducing people to a non-Christian belief system that has no place in a Catholic setting. For those who don’t know, a labyrinth is a circular maze with eleven concentric circles and a single path which makes 28 loops – seven in each of the four quadrants of the circle. People walk the path as a spiritual device to meditate, relax, or “find their soul assignments” as New Agers like to say. The origin of the labyrinth comes from King Minos of Greek mythology who created the first maze as a prison for a wayward minotaur. It has been used ever since as a religious symbol and spiritual tool by a variety of pagan cultures such as the Mayans, Celts, and Native Americans. The first “Christian” labyrinth appeared in a fourth-century Basilica in Orleansville, Algeria, which contained the words “Sancta Eclesia,” indicating its use for religious purposes. The most famous example can be found at the Cathedral of Chartres in France, which was constructed in the thirteenth century and allegedly used by Christians as a substitute for going on pilgrimage to Jerusalem during the Crusades. Artress openly admits that neopagan journalist and Wiccan priestess, Margot Adler (author of Drawing Down the Moon) and New Ager Jean Houston, one of the founders of the Human Potential Movement, influenced her modern labyrinth movement. Such a firm New Age foundation certainly explains why the emphasis for labyrinth walkers is always upon the self rather than on God. Knowing the belief system of the creator of the modern labyrinth movement hardly makes this so-called “meditation tool” very appealing to Christians. But this doesn’t stop retreat centers in need of the Christian market from presenting the labyrinth in ways that will appeal to them. For instance, some try to “Christianize” it by using terms associated with the Christian mystical tradition although the meanings are radically different (something that is never explained to the walker!). For instance, the three stages of a typical labyrinth walk are referred to as the purgation, illumination and unitive stages, all of which have meaning in the Catholic mystical tradition. But purgation doesn’t mean turning away from sin and embracing the gospel as it does in Christianity; it means “letting go of the details of your life.” Illumination means to “receive what is there for you to receive” rather than the Catholic concept of illumination which is a new closeness to God after a deeper conversion. The unitive stage in labyrinth language is when one “is joining God, your Higher Power, or the healing forces at work in the world” not achieving transforming union with God as is taught in the Catholic tradition. Labyrinths are also used in a variety of pagan rituals, many of which can do serious harm to the soul. For example, after publishing an article about the labyrinth in our diocesan newspaper, I got a phone call from a woman whose son had begun to run with a crowd of young men who were all wearing a strange symbol on a chain around their necks. Ever since he began running with this crowd, he stopped going to church and no longer believed in God. It was not until she opened the paper and saw the picture that we ran along with the article that she recognized the symbol her son was wearing – a labyrinth! The labyrinth might be the hip thing to do at retreat centers these days, but one hardly needs to rely on such a devious device to find God, meditate, or make sense out of life. There is much more to be said about the labyrinth which is why we have published a booklet about it in our Learn to Discern: Is it Christian or New Age series. You can find more information about it by clicking on the “New Age Resources” on the navigation bar above.